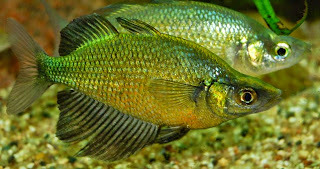 Lake Wanam rainbow fish is beautiful fish with orange and metallic green shade. Glossolepis wanamensis is a very sensitive fish among other rainbows, so care should be taken in maintaining the water parameters stable. This fish is already listed in IUCN's Endangered species list, so take additional responsibility in caring this fish. Males exhibits orange and green metallic shades with black fins. Females are less colorful.